AI starts transforming the way how content is created. Sequence generation has been a fundamental technology in machine writing and translation. A critical challenge is how to generate with constraints on the target sequences. For instance, an advertisement slogan must include certain product keywords; a rewritten query should remain the same semantics; and predicted time series with missing parts should match multiple partially observed values. Existing sequence generation techniques are usually based on decoding with recurrent neural networks (RNNs). However, it is non-trivial to impose constraints on RNNs while maintaining generation quality, since RNNs generate sentences sequentially (or with beam search) from the first token to the last. In this talk, we present two novel methods: CGMH for sentence generation with constraints and BRITS for filling occluded values for multiple related time series. Both CGMH and BRITS achieves high performance compared with previous supervised methods for sequence generation. With these techniques, we build a machine writing bot: Xiaomingbot. For the past two years, Xiaomingbot has created over 150,000 articles about sports, finance, merchant goods, etc. in nine languages, attracting about half-billion views. Lei Li is director and a research scientist of ByteDance AI Lab. His research interest is on machine learning and natural language understanding and generation. 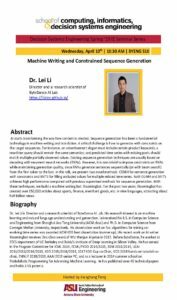 Lei received his bachelor’s in computer science and engineering from Shanghai Jiao Tong University (ACM class) and doctorate in computer science from Carnegie Mellon University, respectively. His dissertation work on fast algorithms for mining co-evolving time series was awarded ACM KDD best dissertation (runner up). 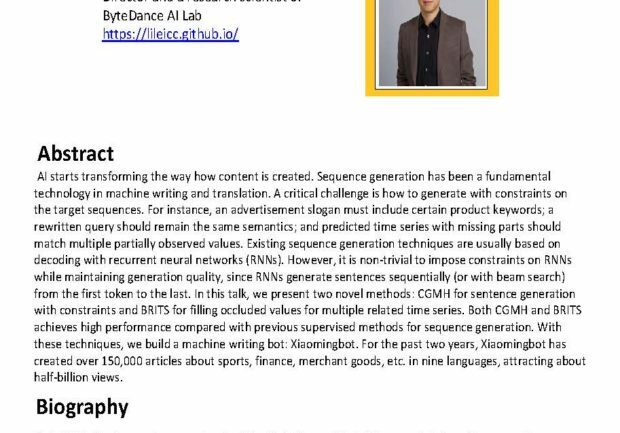 His recent work on AI writer Xiaomingbot received second class award of WU Wenjun AI prize in 2017. Before ByteDance, he worked at EECS department of UC Berkeley and Baidu’s Institute of Deep Learning in Silicon Valley. He has served in the program committee for ICML 2014, ECML/PKDD 2014/2105, SDM 2013/2014, UCAI 2011/2013/2016/2019, KDD 2015/2016/2019, 2017 KDD Cup co-chair, KDD 2018 hands-on tutorial co-chair, EMNLP 2018/2019, AAAI 2019 senior PC and as a lecturer in 2014 summer school of probabilistic programming for advancing machine learning. He has published over 40 technical papers and holds three U.S. patents.